The weather turned warm, the bubbly flowed and the generations met. Half the room remembered the Unicorn Bookshop when it was open between 1967 to 1974 and the other half of the room hadn't heard of the famous alternative bookshop until a few weeks ago. An important part of Brighton's progressive history, the Unicorn Bookshop has been resurrected from distant memory to shine brightly once again in the North Laines. The event saw three speakers. The first was Jolie Booth, instigator of the rebooted mural, talking about her journey to discovering the story of the Unicorn Bookshop and it's larger than life proprietor Bill Butler. This occurred through the creation of her one woman show HIP, about the life of a local woman called Anne Clarke, who worked for a while at the bookshop and whose life was uncovered by Jolie when she squatted Anne's old house, before her death, and discovered the flat had been boarded up with all of Anne's possessions still left inside. This unearthed a huge archive about the city they've both lived in and the people and places Anne's life touched. The second speaker was Generalist blogger John May, who used to write for the NME and is the owner of an astoundingly large archive of counter culture memorabilia and alternative press publications. He marked this as the beginning of the new modern day counter culture movement and called for the creation of a new Arts Lab in Brighton and the resurrection of the Brighton Combination. Last of all was Lizzie Deane, councilor for the North Laines from the Green Party, who spoke of the importance of the North Laines as part of the city's economy and as the progressive heart of Brighton. She acknowledged how important the Unicorn Bookshop had been in the history of Brighton and suggested that the shop and the mural ought to become listed. Thanks to everyone who took part. The mural was recreated through sponsorship from Brighton and Hove Council and is part of a larger project by artist Jolie Booth called HIP Trip of Brighton: A Psychedelic Wander. 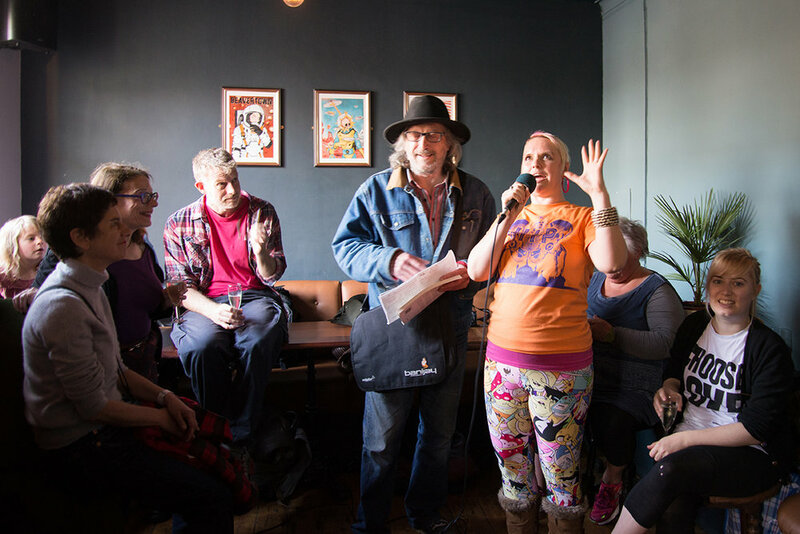 This is a part walking tour, part pub crawl and part theatrical experience running every Friday, Saturday and Sunday throughout May in the Brighton Fringe Festival.